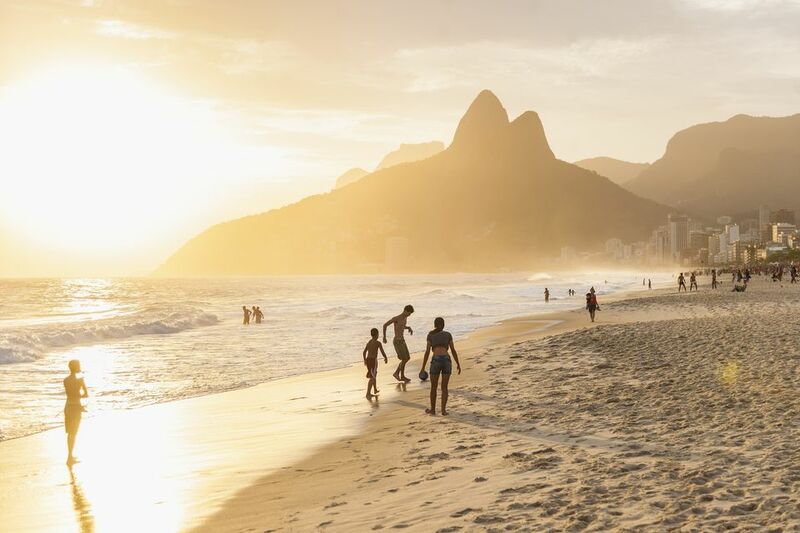 When it's time to relax in Rio de Janeiro, people flock to one of the beautiful beaches in Rio. Cariocas, as Rio residents are called, treat the beach as their outdoor playground. During a long day of sunbathing and playing beach sports, Cariocas satisfy their thirst and hunger with the following popular beach snacks and drinks. Perhaps the most popular drink in all of Brazil, água de coco is coconut water drunk fresh from a young green coconut. Brazilians believe that the natural properties of coconuts make them the perfect hydrating drink after a long day in the sun. You'll find coconut vendors, often with just a ​wheel barrow, on beaches and sidewalks throughout the city. After paying a few reais (the Real is the Brazilian currency), you'll see the vendor chop off the top of a coconut with a long knife. Drink the coconut water with a straw, and if you'd like, you can return and ask the vendor to open the coconut so that you can scoop out the sweet coconut meat. Kebabs, or espetinhos ("little skewers," pronounced "eh-speh-CHEE-nyos") are a popular beach snack on Rio de Janeiro's beaches. Skewers of shrimp (camarão) or grilled white cheese (queijo de coalho) are the most common varieties. Caipirinha (pronounced kai-pee-REE-nyah) is the classic Brazilian cocktail made with fresh lime, sugar, and cachaça, a very popular distilled spirit made from sugarcane juice. A similar drink is ​caipiroska, made with vodka instead of cachaça. Caipirinhas can be purchased at some beach kiosks for about 10 reais. Many Brazilians will opt for a cerveja (beer) instead of a caipirinha while relaxing on the beach. Beer in Brazil is typically served ice cold in a bottle or can. The most common choices are light, pilsner-style beer such as Antarctica, Brahma, Skol, and Kaiser. A popular beach snack in Brazil is roasted nuts, especially cashews (castanha de caju) and amendoim (peanuts). These are typically sold by people walking the beach with a large bag of nuts. They will be given to you either in a paper cup or, if you're sitting at a table and the nuts are in a shell, as a handful or two on the table. We've all heard of açaí and its health properties, but Brazilians have been eating açaí for years. This small fruit from the Amazon rainforest is typically found as a frozen pulp in cities like Rio de Janeiro and served with the consistency of a thick smoothie. On the beaches of Rio de Janeiro, you can order açaí na tigela, or açaí in a bowl, which is usually topped with sliced banana and granola. It makes a refreshing and healthy beach snack! One of the most popular choices for snacks in Brazil, esfiha is a type of snack from the Middle East that has become part of Brazilian cuisine thanks to immigrant groups from Lebanon and Syria. Esfihas are small flatbreads filled with various savory mixes, such as ground beef with onions and peppers, or cheese with escarole. Other similar street foods in Brazil include pastel, empadinha, and coxinha--all cheap, easy, and delicious! After a day of drinking cervejas on the beach in Rio, you may feel like having something sweet. The most frequent choice is sorvete (ice cream, pronounced "sor-VEH-chee"), which ais usually sold as ice cream bars and popsicles (paletas or picoles) in various fruit flavors. Try a Brazilian popsicle such as morango com leite condesado (strawberry with sweet condensed milk) or milho verde (sweet corn). Some vendors sell doces caseiro (homemade Brazilian sweets). The most common is cocada, made with grated coconut and sugar, but you might also see the extra chewy version quebra queixo (meaning "chin breaker") and various desserts made with sweet condensed milk, like brigadeiro, which is balls of condensed milk mixed with chocolate and coated in chocolate sprinkles.